Hello and Happy January, everyone! Can you believe it’s already 2017?? 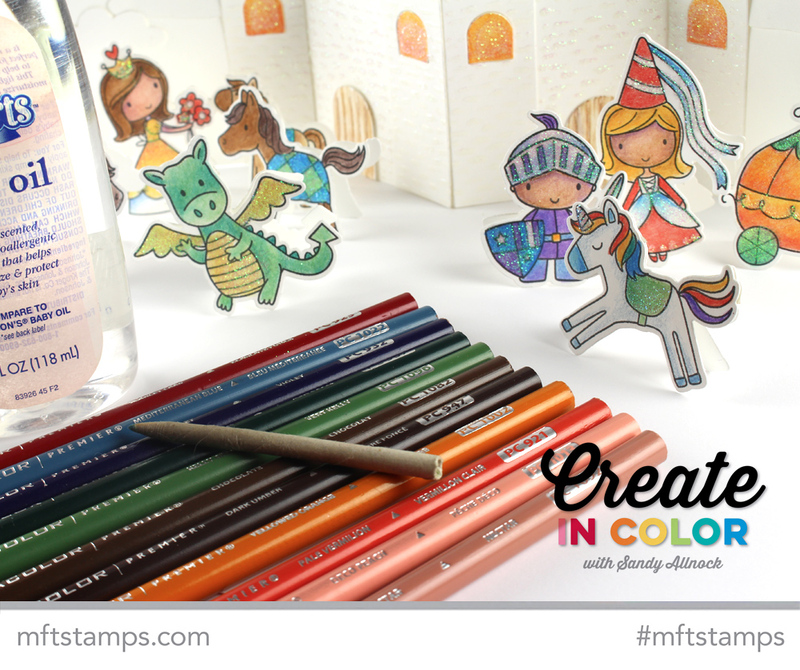 This is another of my monthly installments of “Create in Color” for MFT! (Click HERE to see the others!) Last month a number of folks asked for colored pencil – and a few asked for the “Magic Colored Pencil” Technique. Your wish is granted! 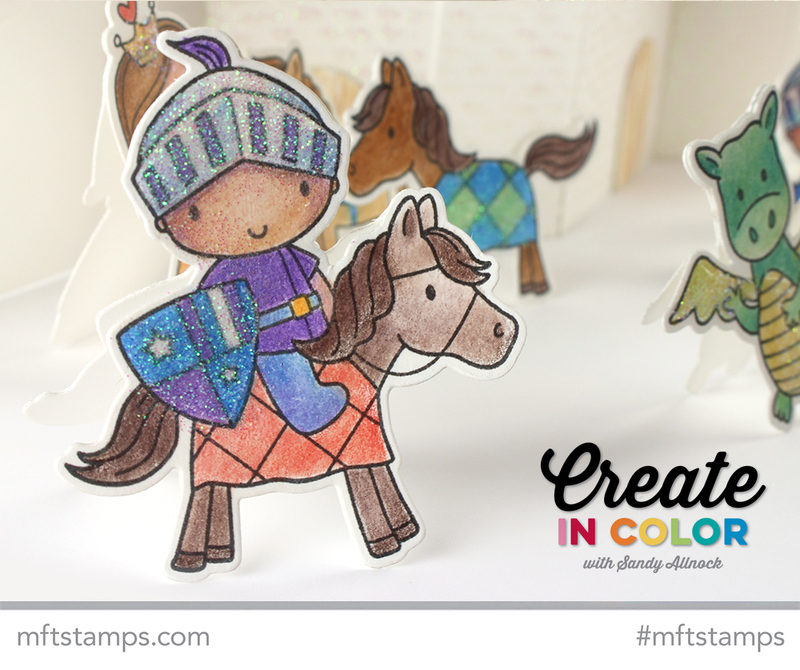 I chose some really darling stamps with a true fantasy element to them. 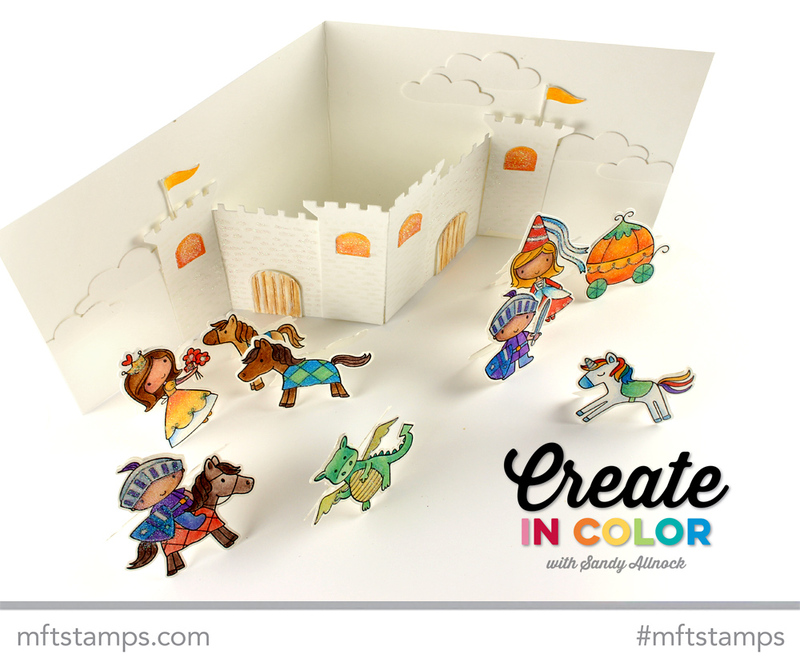 And a set of dies that you can use to build a custom castle of your own design! The castle was fun to design – I didn’t use all the parts in the die set, but try cutting them all out and arranging them til you come up with a structure you like! 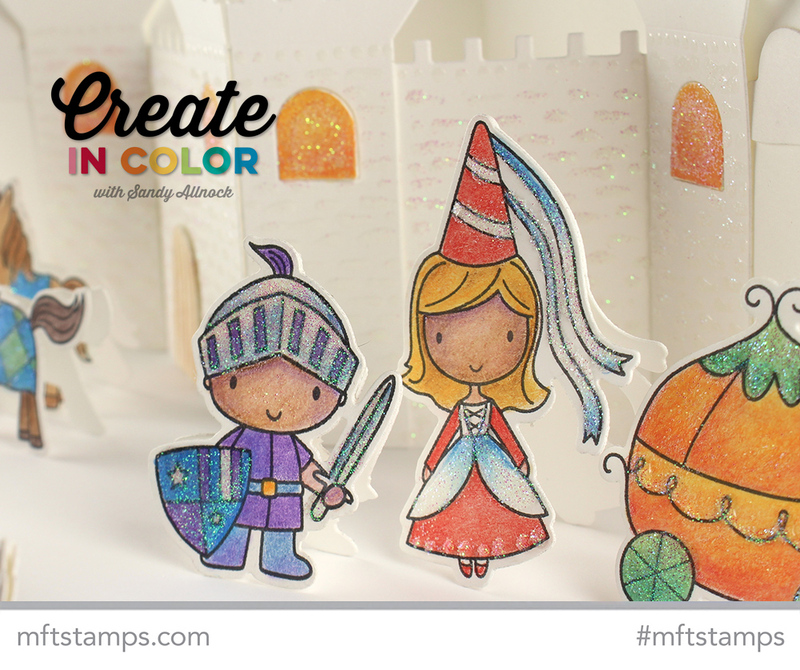 Note that this project could be a card like I made it to be – or could instead be a gift for a child who loves playing with paper fantasy toys! Watch the video below or click HERE to see it in HD on YouTube! 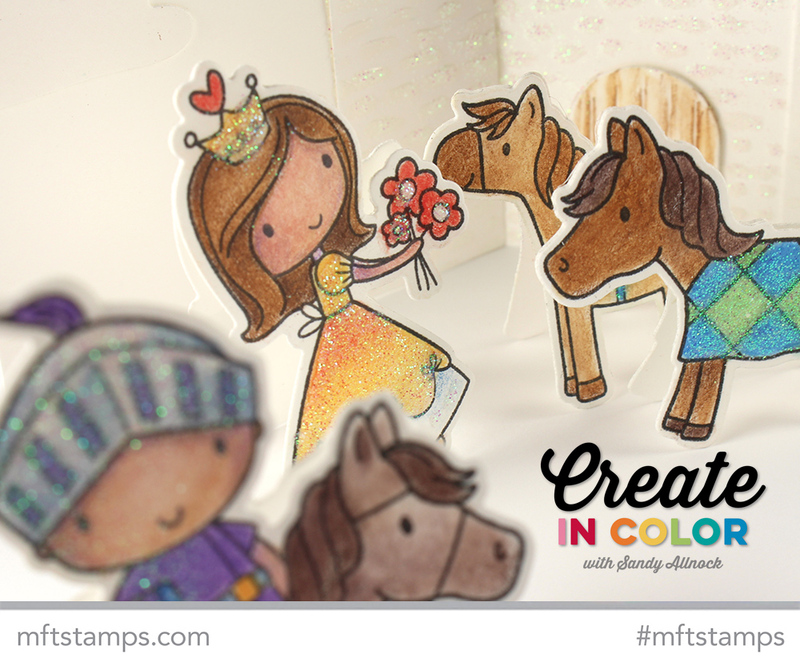 The little princess is feeding flowers to her stable of ponies…..
And the little knight has a bedazzled helmet! His enemies won’t be able to see him during battle since the sunlight will be twinkling off all that shimmer. 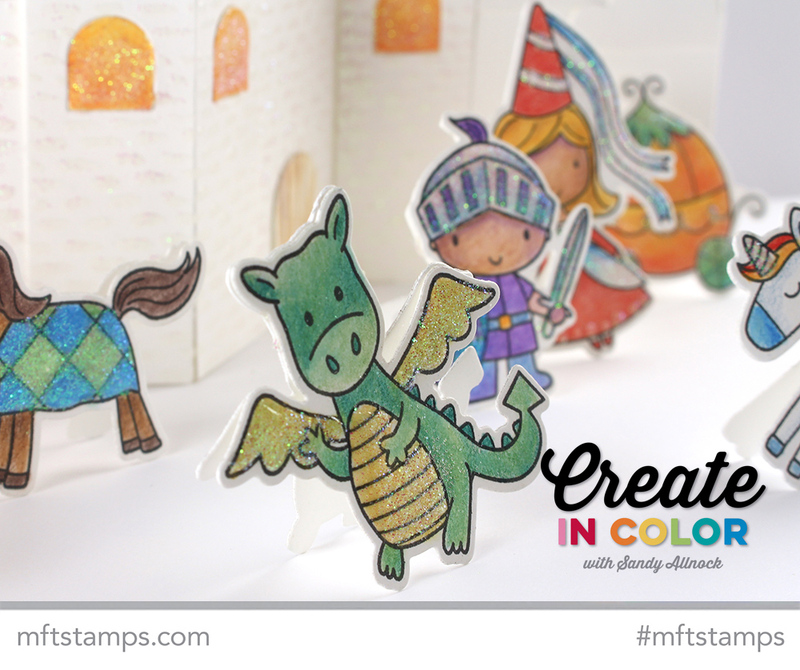 A ferocious dragon will guard the castle – or perhaps draw some angry eyebrows on him so the knight has someone to fight! To get the creatures to stand up, a second diecut is glued just at the top – I made a little score line on each one so the two pieces separate and make the figures stand on their own. The glitter was added to Glossy Accents – you could also just let the shiny coating add to the images without using glitter, but…why not, right? Wow! Simply amazing. Loved the idea, great for on the go to keep children entertained! Thanks for sharing. So much fun. Little ones would love this. Sandy, this is the most adorable thing I’ve ever seen! Sent you an email about it! Thanks for sharing and inspiring! I absolutely love the concept as well as the coloring. I have a baby princess due in March and am going to make a baby shower card for our future princess! Very interesting! Great ideas! I can’t find any info about the pencil sharpener you used. Am I missing it somewhere? 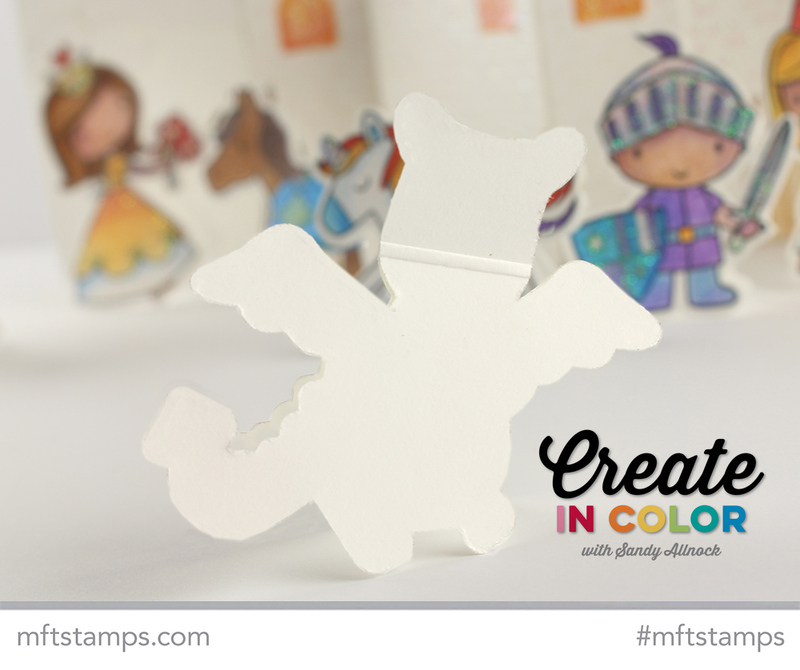 Perfect and MFT has a Dragons set that will co-ordinate beautifully. Love the castle and how interesting to do the brick detail in Glossy Accents! I love the card. It is so much fun creating scenes. Thank you. I love to watch you color Sandy. You make my day and give me confidence to try new mediums. An absolutely precious card! TFS! Love it. I’d it a card or a toy? It’s both! I love this pop up card. Hours of fun story time is in the work while looking at this card!